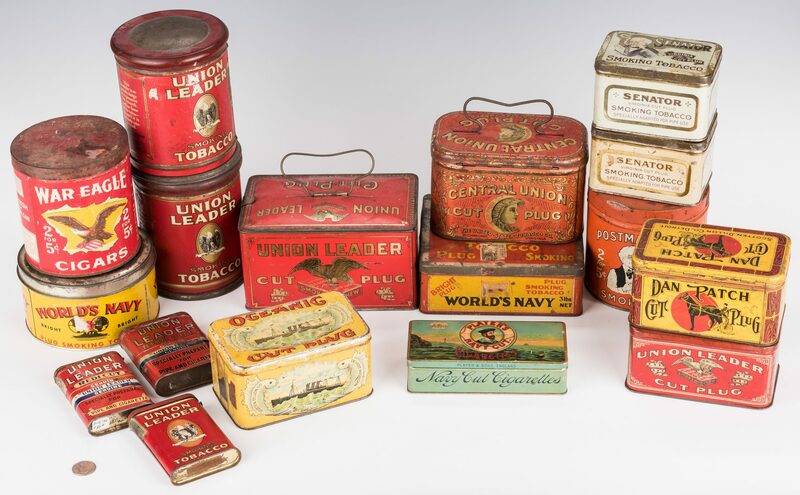 Seventeen (17) advertising tobacco tins, including War Eagle, World's Navy. 1st item: Cylindrical War Eagle Cigars tobacco tin with white lettering and an image of an eagle against a red ground, surface of tin, with lid. 5 1/4" H x 5" dia. 2nd item: Square World's Navy tobacco tin with black, red, and yellow, lettering and an image of the globe and a ship against a red and yellow ground, surface and lid of tin. IRS tax stamp, lower center of lid and top center of front side. 2 5/8" H x 7 1/4" H x 6 1/2" D. 3rd item: Round World's Navy tobacco tin with black and red lettering and an image of the globe with a ship against a red ground, surface of tin, with lid. IRS stamp, surface of tin. 3 1/4" H x 6 1/8" W. 4th item: Rectangular Central Union Cut Plug "lunch box" tobacco tin with one handle and gilt lettering and an image of a woman and a crescent moon against a red ground, surface of tin. Rectangular hinge lid with metal clasp, top of tin. 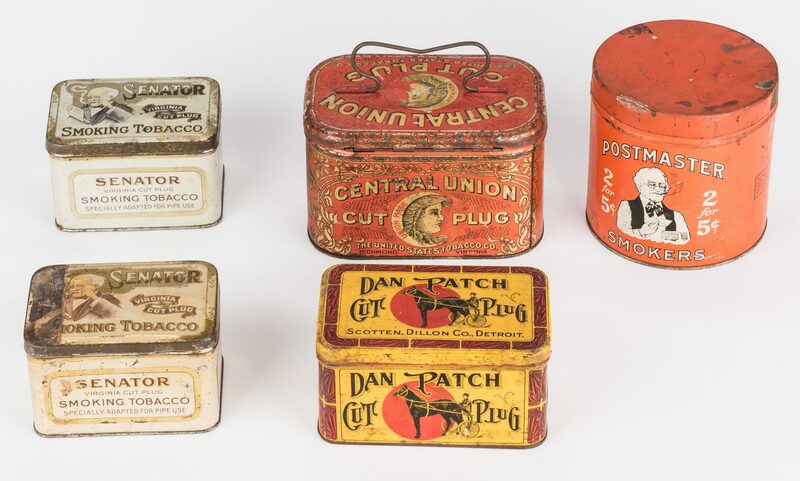 4 3/8" H x 6 1/2" W x 4 1/2" D. Overall – 6" H. 5th-6th items: Two rectangular Senator Virginia Cut Plug tobacco tins in gilt and brown lettering with image of an elderly senator against off white ground, surface and hinged lid of tin. Two stamps, one a Canadian tax stamp, lid and surface of one tin. 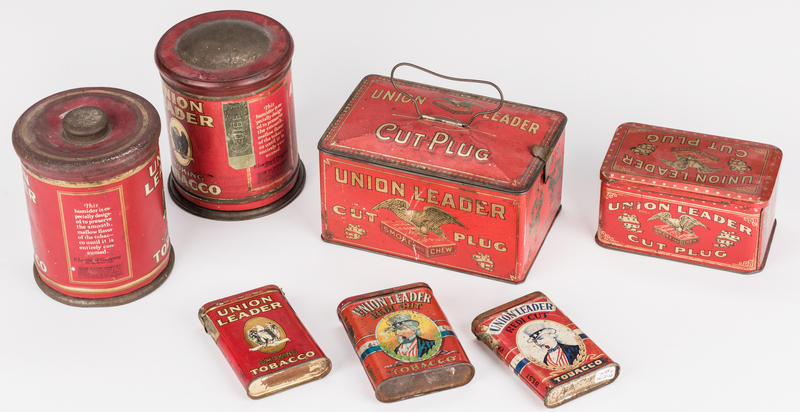 3" H x 4 7/8" W x 3 5/8" D. 7th item: Rectangular Union Leader Cut Plug "lunch box" tobacco tin with one handle and gilt lettering and an image of an eagle against a red ground, surface of tin, with hinged lid with metal clasp.. 4 1/4" H x 7 3/4" W x 5" D. Overall – 6 3/8" H. 8th item: Rectangular Union Leader Cut Plug tobacco tin with gilt lettering and an image of an eagle against a red ground, surface and hinged lid of tin. 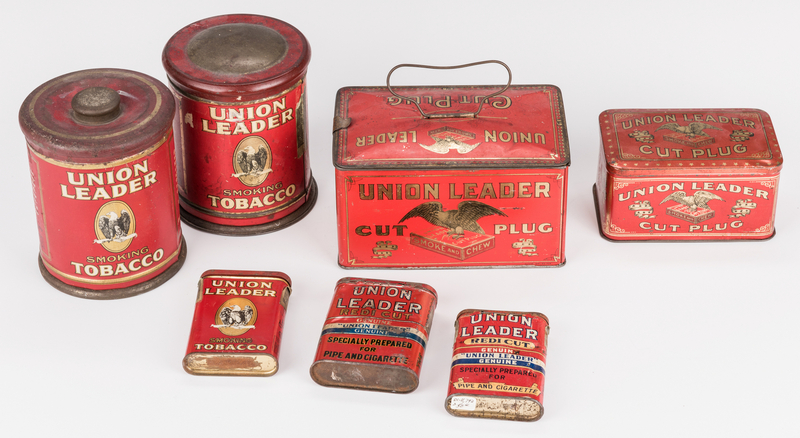 3 1/8" H x 6" W x 3 3/4" D. 9th-10th items: Two cylindrical Union Leader Cut Plug tobacco tins with gilt and white lettering and an image of an eagle against red grounds, surface of tins, with round lids. Two IRS tax stamps, one dated "1910", surface of one tin. 6 1/4" H x 5 1/4" dia. 11th-13th items: Three Union Leader tobacco tins in white lettering, two with images of Uncle Sam, one with images of an eagle against red grounds, surface of tins, with oval hinged lids. IRS tax stamps, one dated "1917", surface of lids and top left and right of tins. 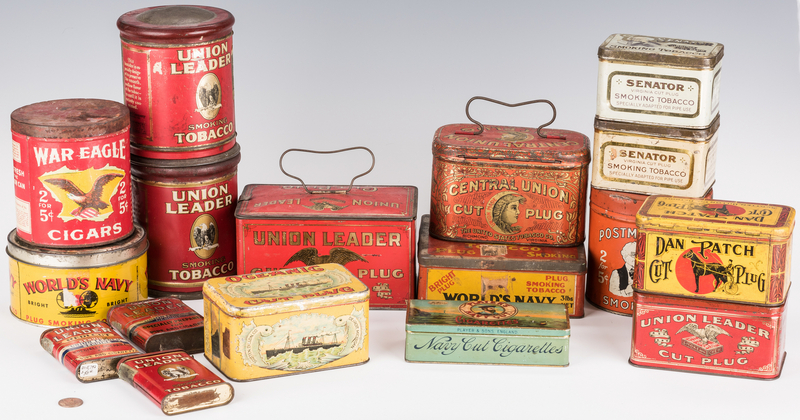 14th item: Rectangular Oceanic Cut Plug tobacco tin in red and black lettering with an image of a ship flanked by two fish against a yellow ground, surface and hinged lid of tin. IRS tax stamps, one dated "1910" one "Union Made" stamps, surface of tin. 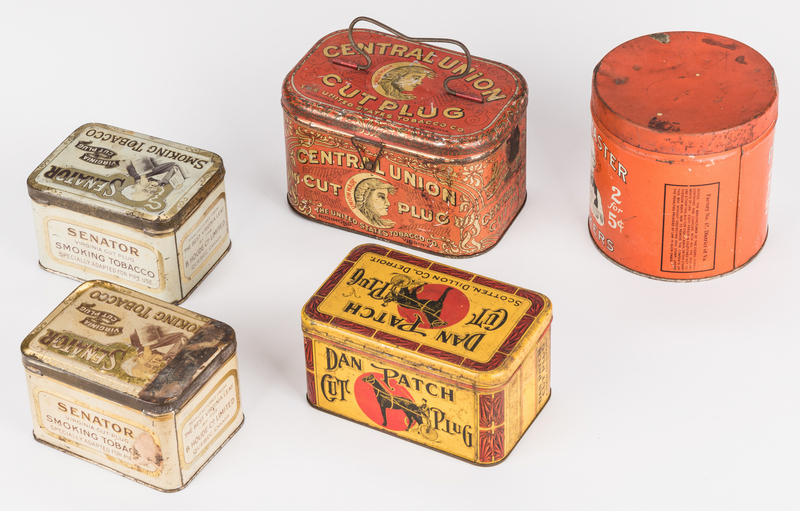 3 1/8" H x 6" W x 3 3/4" D. 15th item: Rectangular Dan Patch Cut Plug tobacco tin in black lettering with and image of a man and a horse against a yellow and red ground, surface and hinged lid of tin. 3 1/4" H x 6" W x 3 3/4" D. 16th item: Cylindrical Postmaster Smokers tobacco tin in which an black lettering with an image of a smoking postmaster against an orange ground, surface of tin. Round lid, top if tin. 5 1/4" H x 5 1/4" dia. 17th item: Rectangular Player's Navy Cut Cigarettes tobacco tin in red and blue lettering with the image of a sailor against a seascape ground, lid, seafoam green ground, surface of tin. Image of sailor and seascape repeated inside of hinged lid. 1 3/4" H x 6 3/4" W x 3" D. CONDITION: Overall good condition. Areas of rust, dents and scratches or stains in varying degrees, surface and lids of some tins. Some lids difficult to open due to bends in lids. Some loss to decoration. Please examine photos.